Despite being called wallpaper, there’s no reason you can’t use these lovely retro video game wraps to cover every last inch of space in your home. In addition to walls, they’d look just as fetching on your floors, ceilings, and even as a stylish alternative to aluminum siding outside. 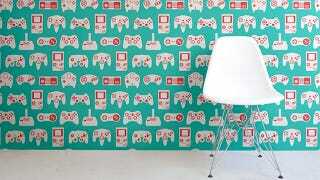 Available in nine different color schemes, the wallpaper features patterns of various controllers and handheld consoles from the past 30 years of gaming. Everything from the Atari to the Game Boy appears to be represented. The only thing missing might be the original Xbox’s controller, but that would never fit on a wall anyways.